What Is I Ching Hexagram 11 All About? 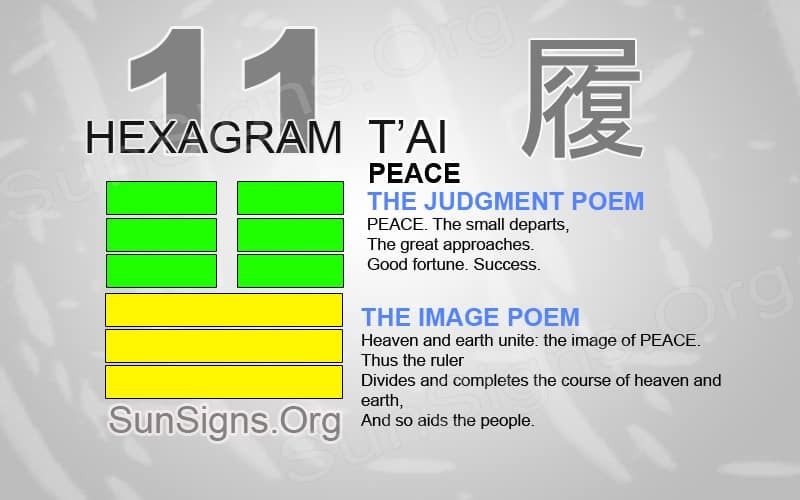 T’ai is the Chinese name of the I Ching Hexagram 11. It has inner and outer trigrams forming earth over Heaven. This Hexagram is called ‘peace‘ or named ‘pervading’ or ‘tranquility.’ Hexagram 11 symbolizes a time of peace and success. It’s a phase in life that you should enjoy. But, also review to know how this time of tranquility came about. There is a constant longing for a time of peace in our lives. Hexagram 11 represents this phase in life. It is a time that you should enjoy to the fullest. But also, be sure to ponder to understand how this period came about. By reviewing previous actions and events, it is then possible to cause others periods of peace in the future. This means not taking this time of harmony for granted. Use this time wisely and increase your karma by performing a service to someone else. Hexagram 11 represents everything that is possible when we allow peace to fill our lives. It is a moment in time that you often chase after. Sometimes you can miss it if you don’t recognize the present and only focus on the future. A successful journey includes accomplishing each part of the trip, one hour at a time. When a break finally appears in a rush, it is to be enjoyed but with a respectful and humble mind. Do not use this time without care or consideration. It is like obtaining free time in the day and not using this precious time wisely. When the universe gives us a precious gift, we must share it with others to receive this gift once again. Many different thoughts of peace and tranquility come to mind. Perhaps it’s a nice spring afternoon when you are walking home from work. The flowers have started to blossom. The air is filled with the sweet smell of early blooms. It could be a boat ride around a lake on a bright, sunny day. We all hold memories of periods of peace in our lives. It can be as simple as a period when we lived without difficulties or worries. Whatever form of peace that might fill our lives, realize and enjoy it. But also try to understand the reason for it happening. In life, there are no phases that will last forever. Every period is temporary, which includes peaceful moments in life. But it is possible to put into action and cause a period of peace. This is done by pondering on what causes these moments in life. We can discover what brings us peace and happiness. And by performing these actions, we might gain a moment of calmness. To prolong a period of peace, we can use this time wisely to bring peace to others. Think of a person that might need special care or assistance. Think about what you can do to bring peace into their lives. It is the small acts of kindness that have the largest impact on someone’s life. It does not take much effort to bestow peace onto someone else. The self-gratitude we receive when we perform service for someone else can help prolong times of tranquility in our own lives. Be kind to your love and respect everyone. This time of peace can be a success in the work area. Repeat his easily when taking similar steps to complete a project or accomplish a goal. Periods of peace don’t need to be long for you to enjoy them. Remember that every event and period in the life path is temporary. Nothing lasts forever on this Earth. It is important when given much, to not take it for granted. When we become successful and can change the environment around us. We will never forget what it’s like not to be in a time of peace. Research how to place yourself in a tranquil state. Longing for peace is a part of human nature. But, knowing what to do with this time is an act of wisdom.